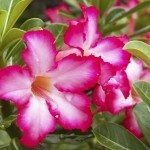 Desert Rose does well in slightly smaller pot, but eventually does outgrow it's container. I would wait to move the plant into a pot 1/2 inch larger then the existing pot, when the plant is done blooming. 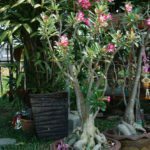 Use a soil that is used for cactus and succulents. Keep the root ball at the same depth as it was in the previous pot, which should be about 1 to 2 inches of the root ball above the soil surface.